CINDERELLA, 1950. Original 1 Sheet (27 x 41” / 69 x 104 cm) folded 1981 Re-Release Movie Poster starring Ilene Woods, Eleanor Audley, and Verna Felton. Produced by Walt Disney, and directed by Clyde Geronimi. 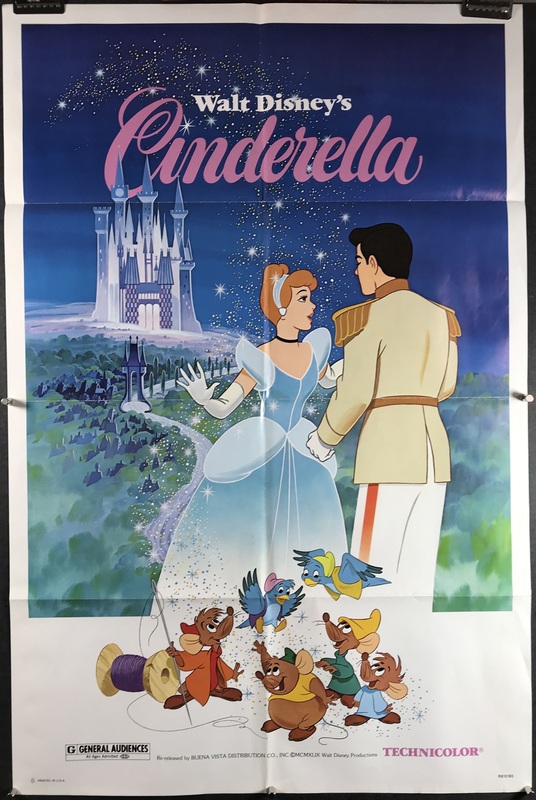 In this Walt Disney animated classic, Cinderella is a step-daughter that’s treated like a slave maid in the home of her wicked step-family of 1 step-mother and 3 step-sisters. The Prince holds a royal ball that Cinderella is forbidden to attend by her step-mother, and can only attend after her wish is granted by her Fairy Godmother to disguise her in a beautiful blue ball-gown with glass slippers. The only requisite is “be home by midnight”. This folded 1 sheet poster is in very good C8 condition and does not have any major imperfections and only a couple minor imperfections to note. There is some slight color loss along the horizontal fold lines, and some bending down the center fold line, which could be taken care of during the linen backing process. Linen Backing is available for an additional $80 upon request or by adding the service to your cart below. This would produce a flat, backed poster that’s ready to display! We linen back and frame all of our posters IN HOUSE at our studio in Katy, TX!